Routing Number on a Check. How do I write a check and where do I write the amount and the Payee name? A routing number, ABA number, ACH routing number or routing transit number (RTN) is a 9 digit number that is used to identify a bank or a financial institution in a financial transaction. American banks and credit unions usually have multiple routing numbers that have different uses, or service certain geographical regions or branches. There are 2 types of routing numbers. 1. ABA Routing Numbers (routing transit number). ABA stands for American Bankers Association. ABA Routing Numbers are used for sorting and shipment of paper checks back to the check-writer’s account. It is also used in the transmission of electronic copies of the checks. 2. ACH Routing Numbers. ACH stands for Automated Clearing House. An ACH routing number is similarly a 9 digit bank code that is used in the United States. Automated Clearing House is used to process direct deposits, bill payments, and other such automated transfers. ACH is entirely electronic. Many financial institutions and banks use the same routing number for ABA transfers as ACH transfers. When you as a bank customer is dealing with a check, it is the ABA routing number on the check that you need to locate. ABA Routing numbers are printed on the bottom left hand side of a check. You can also search your bank’s online website for routing numbers to find the routing number, that you need. The routing number is printed on the bottom LEFT side of a check. The account number is the number on the bottom in the MIDDLE. The number on the bottom right-hand side is the check number. As you can see on the image above, the account number is printed on the bottom of the check, in the middle, as the second number. Occasionally, the placement is switched with the check number, but rarely. To determine which is your account number, simply choose the longest number. The check account number is private and the number determines that bank account should be used. The few ways to find your account number is on your personal checks or by signing into your online account. Where is the Check Number, on a check? The check number appears in two places on a check: At the bottom of a check on th right hand side, and at the top of the check, on the right hand side. They check number is the shortest set of number on the check and hold no significance besides helping you keep track of the checks that you are writing. If you are new to check usage, then you might be unsure where to write what on a check. This image chart should help clarify all the numbers and spaces that you can find on a check. 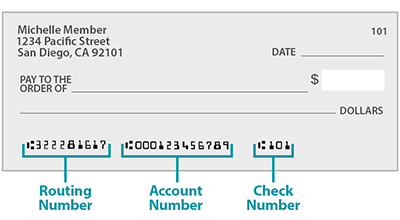 All the numbers and spaces on a check, explained. Pair a number with the number description below. 2. Payee line. Who the check is payable to. 3. The dollar box. The check amount in numerical format. 4. The check amount written out using words instead of numbers. 5. Memo line for an unofficial note. 8. Your banks’s contact information or logo. 9. Your bank’s ABA routing number. 10. Your account number at the bank. 12. Your bank’s fractional number. Please share your experiences, questions or advice on check writing, in the comment section.